The latest version of AmpliTube iOS, version 4.7, is available for download now on the Apple App Store. With this update we've included top-selling gear from AmpliTube Mac/PC. That's right, we've added what you wanted: 10 new Officially Licensed gear models including models from Seymour Duncan, Morley, Carvin, Jet City, Dr. Z, and more! Even better, if you have the All-Amps Collection 2018, All Stomps Collection 2018 or All-In Bundle 2018 bundle you can update now to get them free! It rocks, it twangs, and it provides incredible touch sensitivity to go along with killer tone. Push the volume past 12, on this 30W tube head and it will start getting crunchy. Turn the volume up higher and listen to it scream. With the amp set for crunch, roll off your guitar volume to get a clean tone without harshness. With two channels of Soldano tone and its pure tube power, this amp was made for the big stage. The Normal channel has plenty of headroom to deliver clear, bright clean tones and can also be driven hard enough to get downright raunchy. The Overdrive channel is based on the the circuit that made Soldano famous. Twin channel 30 watt guitar head. Featuring a unique two stage preamp which has a massive tonal range using just three controls per channel. The Fat Channel delivers warmer tones whilst the Tiny Terror Channel has the sonic character of the original Tiny Terror. The 50 watt V3M amp is the musician's dream, delivering awesome power with incredible tone including lush reverb. The V3M is one of the most versatile amplifiers available. One of the most versatile yet modern sounding wah pedals. Thanks to its array of controls it can be tweaked to suit many styles and sounds. Cabinet with two 12-inch speakers matched to the V3M amp head. 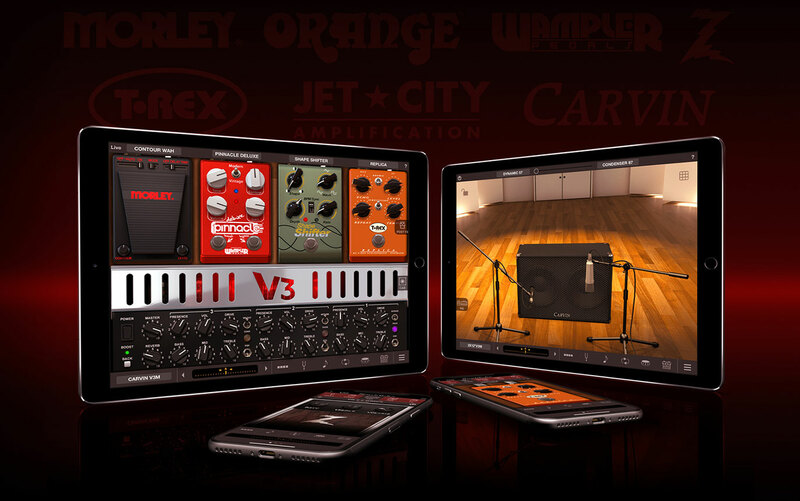 The new models are available now for version 4.7 of the AmpliTube or AmpliTube CS apps for iPhone and iPad. They can be purchased a la carte via the in-app shop for only $3.99 per stomp or $6.99 per amp with matching cab. They’re also available collectively inside the AmpliTube Deluxe bundle as well as inside the All-Amps Collection 2018, All Stomps Collection 2018 and All-In Bundle 2018 bundles. This new gear is free to users who have already purchased these bundles. Although IK strives to provide accurate product and pricing information, unintentional pricing or typographical errors may occur. In-app purchase and app pricing is shown in USD, your territory pricing will vary based on Apple's App Store pricing model. Prices do not include taxes. IK reserves the right to correct, change or update information such as pricing, availability and product descriptions, at any time without notice. I made the update. But the new gears listed in the app are marked with a +. That is, I should buy them. I already bought the "bundle 2018" a few months ago. I understand, that I am eligible to update for free. What now? Please help! It's frightening how much time this will take. muddi wrote: I made the update. But the new gears listed in the app are marked with a +. That is, I should buy them. I already bought the "bundle 2018" a few months ago. I understand, that I am eligible to update for free. What now? Please help! It's frightening how much time this will take. You should be able to simply update the app via the normal process (if you don't have automatic updates for apps set up, you open the App Store app on your iOS device, tap "Updates" and then update all or each app separately there) and then do Restore In-App Purchases via the in-app menu (menu button --> Store --> Restore In-app Purchases). If that still doesn't work, please open a ticket with IK Support at http://www.ikmultimedia.com/contact-support and they will assist you.